A cottage rental in the village! 1/2 mile from our village center, town dock, library, etc. 1/3 mile from Door County Trolley's main hub and Headquarters! Now renting via VRBO! 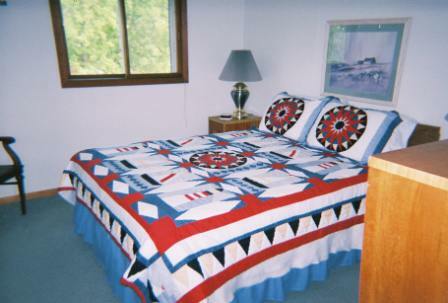 "Country quiet, impeccably clean, cottage rates at motel prices. Directions: GPS 7960 Church Street, Egg Harbor 54209 or go to http://www.mapquest.com or Click Here! They finally convinced me to go "High Tech," so you now can go through VRBO to book our cottage. There are many advantages, but you will have to pay more as it costs us roughly 11% to use there services. Your best option, will always be to deal direct with Emily at 920-559-7475 or me at 608-712-7880. Either way, we'll confirm your reservation and arrange to work with you the week before you arrive making sure everything will be ready and waiting for you. We do all our own cleaning, so we ask all our tenants to arrive after 3 p.m. and checkout prior to 10 a.m., so we have time to ready our cottage for our next guests. **Click here for our 2018 - 2019 rates when renting directly through us! *We're building a Veteran Memorial fire pit in memory of the five Door County Veterans who we're Killed in Action (KIA) in Vietnam. When completed, it will be free for veterans and made available to our guests for an addition $25 per night. Go to www.DoorCountyVeterans.com for more information. Don't delay, we're filling up fast. Call Emily at 920-559-7475 or Rich at 608-712-7880! Modern living in a rural setting! Click here for the top 70 reasons to stay with us! Our cottage is ideal for two couples, comfortable for six, and doable for overnight sleeping a maximum of eight. You'll be in an ideal location to leave your car parked in the yard. You'll be less than 1/2 mile from the village center, town dock and the hub for Door County Trolley's, and less than a mile from three golf courses and two of the best beaching in Door County. My family came to Egg Harbor in 1869! Our cottage in ideal for two couples; one up and one down or a family of six. You enjoy twice the space, ten times the privacy, at 1/2 the cost of staying in a motel or condo. Our 2018 - 2019 rates can't be beat! Reservations made prior to April 21, 2016 will be confirmed at our 2015 rates! Weekly rates start at $900 for four ($100 for each additional person) in spring and fall! 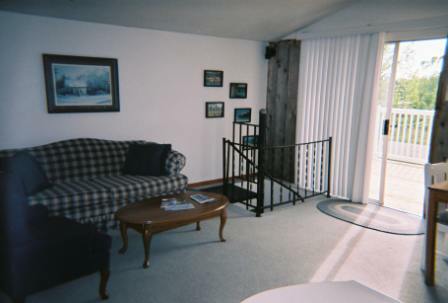 Our two story cottage is ideal for two couples or 6 close friends. * We ask you to bring your own bath towels when staying a week or more. Towels are available if you forget. Our nightly rate is $150 for two plus $25 for each additional person (bath towels included). Please remember! 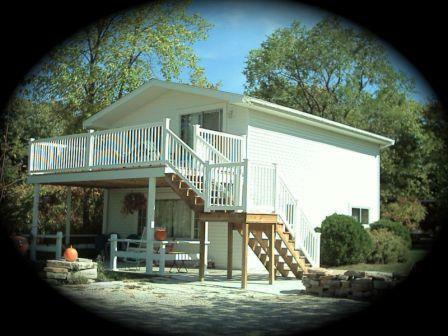 You're renting a fully equipped, smoke free, no pets allowed, country cottage on private acres. Note: Wisconsin has a 5.5% State sales tax and Door County has a 5.5% room tax! When renting direct, we don't accept credit cards but do accept personal checks. We'll be set up on VRBO sometime in February. Sorry for the delay. How you too can save money? Park at Woldt's Farmette and walk 1/2 mile south to town! Click here and check out our village. Or, 1/3 mile north and take the Door County Trolley. Click here and check out their schedule of tours. * The Peninsula Players about three miles north on Hwy 42. * Peninsula State Park and the American Folklore Theater. * Check out four of the 11 Door County golf courses within a long walk or short drive. For example: Birch Creek' Music Performance Center is just up the road on E, The Peninsula Players is three miles north, and The Northern Sky Theater, formerly the American Folklore Theater, performs six miles north in the woods at the Peninsula State Park. Four of Door County's 11 golf courses are within a long walk or short drive from our cottage. Golfers! We have free pull carts you can use to save the cost of renting a golf cart or spending time at the "Y". Hurry! We only have one cottage and no big road sign or hired staff to flag you down. YOU need to call us if you're in the county and forgot to make a reservation. So before you miss staying with us, call Emily at 920-559-7475. Directions... Enter 7960 Church Street, Egg Harbor 54209 at http://www.mapquest.com or Click Here! We recommend reservations BUT, if you're on the way to Door Co. without a place to stay, call Emily 920-559-7475 or Rich 608-712-7880 and let us help you find the best deal in Door County! A Personal Request From Rich and Emily Woldt! While in Door County please help us safeguard our shoreline against invasive species. When in Door County and you need emergency travel assistance call 211. Click here for a copy of their "Hatchlings" news letter. Click here for Google map view! Click here for a Google map and driving directions! We're #5 on the EHBA 2010 brochure map! Click here and tour Egg Harbor! Location: You'll be in a rural setting yet within walking distance to...restaurants, coffee shops, churches, shopping, and night clubs, a short drive to beaches, horseback riding, the town dock, four golf courses, a driving range; less than three miles from the Peninsula Players, Birch Creek Music Center, boat launches and miniature golf, and under six miles from Fish Creek, the Peninsula State Park (home of the American Folk Lore Theater, Bailey’s Harbor, Kangaroo Lake and Whitefish Bay State Park, sand dunes and Cave Point. Click here and use our Egg Harbor Business Association's website to plan your vacation! 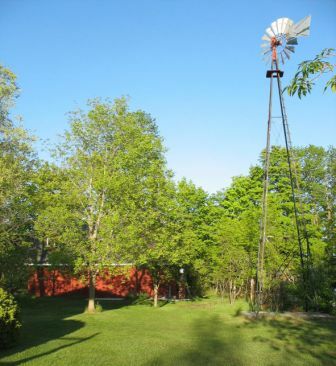 Atmosphere: Our red Dutch Colonial barn, full size windmill, stone fences, and an 18th century log barn, rural setting, woods, 1937 Allis Chalmers, - 52 Chevy, '48 pickup, 'and 28 Chevy flatbed, will remind you of a time when live was less hectic, lodging was $6 per night and a full meal was under $1. 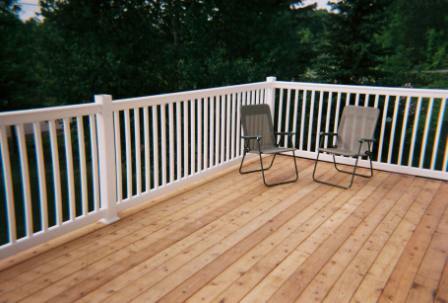 Relax on our deck for an hour and you'll want to stay for the summer! Our cottage has a fully equipped kitchen including microwave. A queen bed upstairs and two doubles down make our cottage comfortable for six. Sleeper sofas upstairs and down offer two extra beds for guests. Satellite TVs, a VCR & CD player plus a stereo will help you escape in air conditioned comfort! Follow highway #42 through Egg Harbor and turn right on “E” then an immediate left on Church Street. Watch for our red barn and full size windmill on the right. If you miss E, turn right on Church just north of Harbor Hardware. Weekly rates start at $1,000 for four ($100 for each additional person)! Our two story cottage is ideal for two couples or 6 close friends. We ask you to bring your own bath towels when staying a week or more. We'll provide all other linens. Our nightly rates start at $150 for two which includes bath towels ($25 for each additional person). Please remember... you're renting a fully equipped, smoke free, no pets allowed, country cottage on private acres. Our "overnight" guest charge is $25 per guest, per night! Unfortunately villages in Door County passed a 5 1/2% room tax that must be collected by anyone renting rooms less than one month. So, if you want to avoid that tax, rent our cottage for four consecutive weeks. Sales tax in Wisconsin is 5 1/2%. You'll be treated like family when you stay with us! We look forward to your business and to your friendship! Rich & Emilty Woldt 920-559-7475! 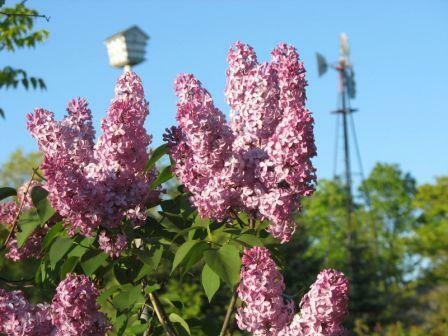 Spring, asparagus and lilacs have arrived! 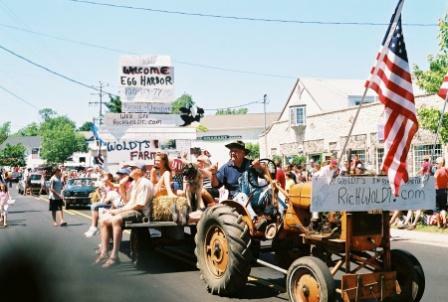 The Egg Harbor Historical Society is sponsoring many events throughout the summer to celebrate our heritage to include publishing family' memories of growing up in Egg Harbor. Click here for a copy of their "Hatchlings" news letter. The Woldt' family tree has grown in Egg Harbor for over 100 years. If you're on our tree and have a memories of Egg Harbor you'd like to share, email them to me at Rich@RichWoldt.com. I'll make sure they're not forgotten. "Egg Harbor Memories" in the subject line so I don't miss them. 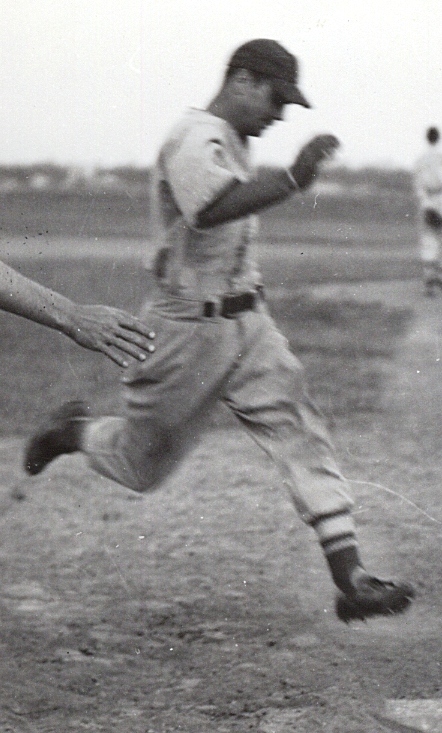 Click here for pdf file of letter sent to Historical Society. Use these links to make reservations in advance at: Birch Creek' Music Performance Center just up the road on Co. E and The Peninsula Players about three miles north on Hwy 42. It's a short ride to the Peninsula State Park and the American Folklore Theater. Check out four of the 11 Door County golf courses within a long walk or short drive from our cottage. 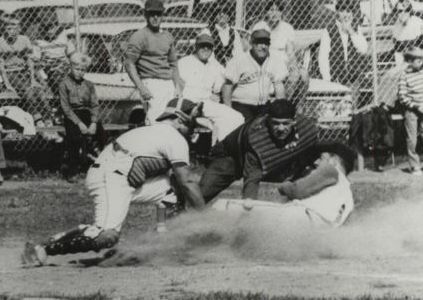 Brothers Deck and Fritz Woldt are in the Door County Baseball Hall of Fame! Memories of growing up on a farm in Door County were too cherished not to share. So, beginning in '83 we've spent summers raising a Dutch colonial barn, rebuilding a windmill, and renovating our property to recapture rural Door County traditions. 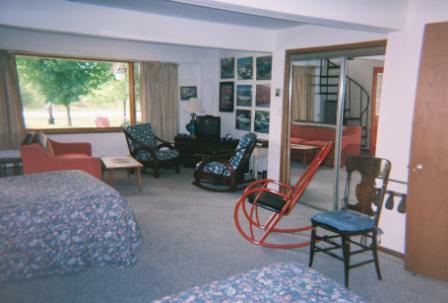 We offer an upscale, modern cottage for a large family or to be shared by couples. Visit in spring and you'll enjoy fresh asparagus from our fields, apple and cherry blossoms, and a chance to welcome the martins to their house south of the barn. Summer offers singing birds in the morning, wild flowers during the day, and country quiet at night. Fall brings leaves, festivals, and farm markets. In winter, we're closed to rest, rebuild, and ready our farmette for your next visit. To learn what's going on in the county click on the links to some of our friends: for example...Birch Creek' Music Performance Center is just up the road on E, The Peninsula Players is about three miles north, and The American Folklore Theater, performs in the woods at the Peninsula State Park. Check out four of the 11 Door County golf courses within a long walk or short drive from our cottage. We are a State (WI) licensed tourist vacation rental, a proud member of the Door County Chamber of Commerce, the Egg Harbor Business Association, and member of "Rent Wisconsin Cabins" click here for a link to a map of Wisconsin cabins. Thank you for considering to rent our cottage! Also visit our Risk Management Learning Center website at www.RMLearningCenter.com, our Risk Management Community outreach site at www.COPs007.com, our Door County Veteran Support website at www.DoorCountyVeterans.com and our VFW Post 8337 site at www.VFWPost8337.com! 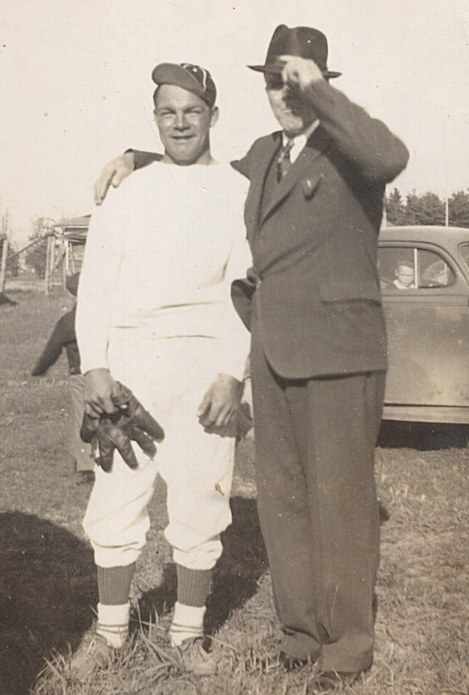 Click here for our Woldt' family history according to Rich! Thank you Sandy ! Click on my picture on the tractor for a message from Paul Harvey. Click here for a "best of times" 50's video! Page down for more money saving suggestions! Click here for a "cure to Obamacare"